System utility with many features. Is there a better alternative to SystemPal? Is SystemPal really the best app in System category? Will SystemPal work good on macOS 10.13.4? SystemPal shows memory/CPU usage status, CPU temperature and fan speed, network status and disk reading/writing status on the menubar. SystemPal is becoming an ALL-IN-ONE app. It also provides a tool kit including mini music player, screenshot capture, memory cleaner. Shows status directly on the menubar. It is very convenient to check system status. SystemPal needs a review. Be the first to review this app and get the discussion started! Shows a mini music player on the menubar. This mini music player controls iTunes to play songs in your iTunes library. It is very convenient to see song name and artist on the menubar. You can also check the album artwork, read the lyrics, rate the song. When you close iTunes, the mini music player will just become a tiny icon. Provides a screen shot utility. You can use it to capture mouse selection, capture a window, capture the whole screen. You can save the screen shot to desktop or save to the clipboard. You also have the option to delay 3 seconds before capturing. 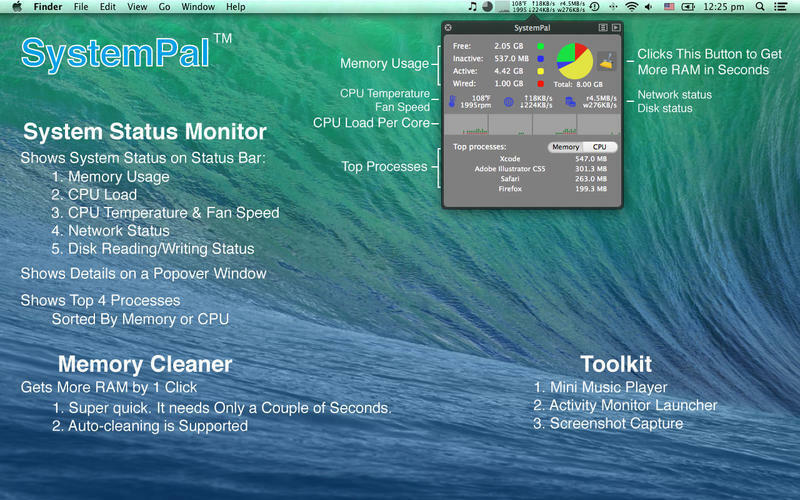 Provides a quick launch for Activity Monitor of OS X.
CPU usage chart. Working well with multi-core processors. Network status (uploading speed and downloading speed). Configurable items showing on the menubar. 1-Click cleaning memory. When you are short of free memory, you can just click 'Clean Memory' on SystemPal and it will finish in a couple of seconds. Auto-cleaning memory. If the free memory is smaller than a certain number, SystemPal will begin to clean memory automatically. Displaying the top processes which consume much memory or CPU resource. You can quit or relaunch apps to get more system resources. Special enhancement for OS X. This utility works perfectly in full screen mode and every space. Auto-run at login (you need to set it in the preferences). SystemPal consumes much less resource than other apps with similar functionalities.